The Ten Commandments is an Easter tradition for many people. The connection seems tenuous to me, but there’s a thread there. I’ve already seen “Commandments”, so I won’t be reviewing it here, but it has me following another connection, that you can already guess at due to the title and the picture to the right. In my mind, that film is much more strongly linked to Ben-Hur than to Easter, but on examination, it seems circumstantial. They’re epics, set in Middle-Eastern antiquity, informed by religious legend, starring Charlton Heston. It seems accidental, though possibly the success of one got the other made. While I don’t know of it being an Easter tradition like its cousin, if anything, this one should be more Easter-related, since it actually has a few scenes with Jesus. On the other hand, its overall reputation is more like CHARIOTS CHARIOTS CHARIOTS. 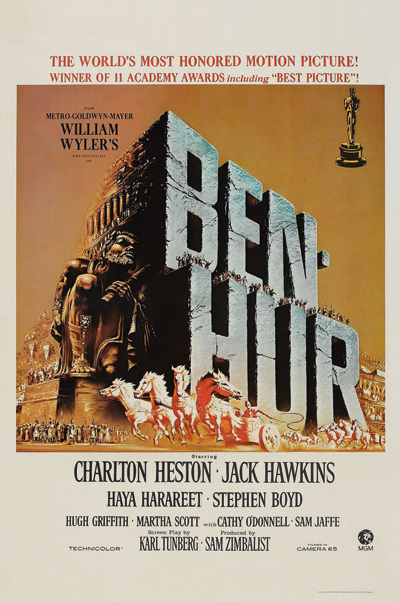 Judah Ben-Hur, a wealthy Jewish prince, reunites with his childhood friend Messala when Messala takes over as the Roman Tribune for Judea, but the homecoming is not altogether happy, as Judah refuses to help Messala placate his people’s thirst for freedom, and their friendship is broken. Later, when Judah and his sister watch the Roman governor’s entry into town from their roof, they accidentally knock stone off, injuring the governor. Messalah takes the opportunity to spin this into an assassination attempt and make an example out of his old friend in order to be feared, jailing Judah’s sister and mother and sending Judah to die a galley slave. Judah’s vow of revenge keeps him strong through three years of forced rowing, and he manages to escape from a shipwreck, saving a Consul’s life and soon finding himself in an even more privileged position than where he started. But he will not rest until his mother and sister are safe and Messala is dead, and that means no time to go listen to the Nazerene teaching on the hill. This story is so episodic that, considering its runtime, it might have been better off as a miniseries, if that was a thing done in the 50s. Judah’s story changes genres and settings multiple times, and the different settings have entirely different sets of characters. Even the theme of “is God helping/going to help Judah?” fades out after a while as he goes through a few episodes of rejecting decent happy endings, until by the end he seems to be consciously determined to find things to be angsty about, as if he’s become addicted to the anger that kept him going for three years on the oars. Is his revenge on Messala empty, or is he just choosing to focus on trying to fix the irreparable now? There’s surprisingly little of Jesus in this film subtitled “A Story of the Christ”. Jesus overrides the first and last chapter, and appears a few times in the middle, but the rest is just Judah’s tragic adventure. I think the point was “Jesus gives hope to a man at his lowest”, but this is a story about getting to the lowest, not about the hope. The hope is a last-minute bittersweet ending, as attending the Crucifixion makes everything better just by getting to hear Jesus. I could have done with either more or less Jesus, as the Gospel events barely touch the plot. I was very engaged with the episodes directly dealing with the home conflict, and there was lovely dialogue throughout. Of course, what really shines is the production value, the opulence, detail, and expanse of the sets and costumes. There were some well-handled wrestling with religious and philosophical questions. The action scenes were both exciting and easy to follow. But the closer it got to the religious message this film wanted to convey, the further it seemed to be from the story I saw it actually telling. Like finding Professor Plum and the Ballroom shuffled into my poker deck. Both good, but at cross purposes (no pun intended).